We've been looking at smaller machines recently in an effort to identify just how practical some of the entry level and portable variants are for woodworkers looking to achieve above average results from a below average spend. Or as my old governor used to say, "champagne lifestyle on a lemonade budget". In November Derek Paine put Kity's 439 planer thicknesser to the test and in the Christmas issue 174 Alan Holtham gave us the low down on Makita's new bandsaw. Continuing the theme and with more to come in future issues, we've asked Derek Paine to report on the second of three entry level machines from Kity, that he's been using for the last six months. The Kity 429 spindle moulder comes complete with wheeled leg stand and lifting handle, making it an ideal machine for manoeuvring into place as and when the need arises. It also comes with sliding carriage for end grain work, spanners and allen keys as self-assembly for these low priced machines is part of the deal. Unfortunately this one came without a manual but once recognised, the problem was dealt with over the phone and the missing literature arrived after a short delay. Having built an identical stand previously for the planer thicknesser, this was less of a problem than it could have been. For distribution in the UK these machines come with a lead to convert the continental plug to a 13amp supply. The sliding carriage comes as standard and when fitted has plenty of adjustment to enable it to be set flush with the table and square with the spindle fences. 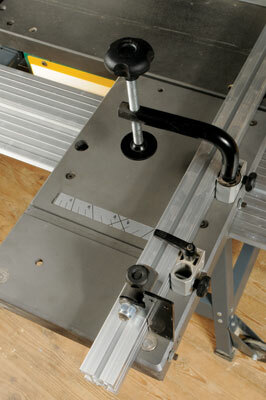 Once set, a clear scale allows you to work at angles of up to 45deg by positioning work along the T-slot. A fine adjuster makes up for any inaccuracy in the scale. For repeat work, a flip-over length stop is also included as part of the extruded aluminium fence. A hold down clamp helps to provide a secure footing for all manner of different sized components. The spring pressure guards are attached to the top of the hood, which is hinged for access to the spindle. To undo this, you slide two knobs in slots towards the centre of the hood. Don't unscrew them more than a half turn as they have short threads and fall into the spindle hood. The pressure springs on this model needed some adjustments to get them parallel to the table and fences but work satisfactorily when done. I wouldn't consider this to be a problem, merely a part of the self-assembly process. The spindle is quiet when running and is braked as you would expect. Being used to more industrial machines, my first impression was that it lacks power for anything other than small cuts. Anything larger would require several passes with progressively deeper cuts. After adjusting my expectations and the habits of a lifetime I learnt to work within its capabilities and would expect a newcomer to this machine to find it quite natural. The cutter block diameter is limited for use in table work and is supplied with two rings to close the opening. These must be trapped under the fences to stop them being lifted into the cutters by the flow of air generated by the cutters once in motion. The fence comes with two aluminium bars to bridge the gap between them when they're extended to give support to the work. In my opinion these leave too big a gap for safety and I wouldn't recommend using them as they are supplied. A reduction in length is very simple allowing you to close the gap around the block to a minimum. Alternatively you could drill some holes in the fences and attach a false fence with the cutters just projecting through. I would even go as far as to say that this should be adopted as part of your standard practise. A small machine by definition will have a short bed so roller stands are required for anything other than short lengths of timber. An out feed table is offered as an accessory and worth the investment as I've always found these to be frustratingly awkward to align. There are several accessories available: a ring fence for curved work and an extension table plus support leg. 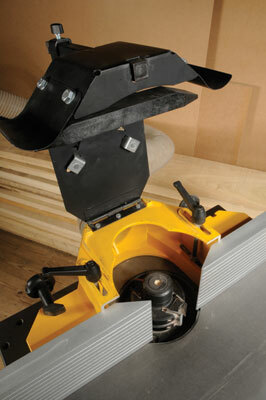 This machine is suited for small moulding and rebate work in the home workshop. 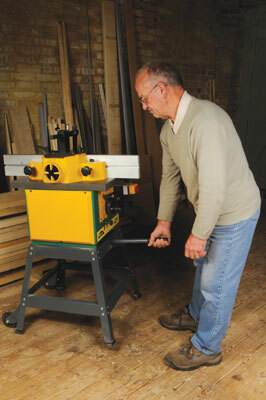 As a portable machine it is very manageable and, used sensitively, capable of working to within reasonable tolerances.